Heat 2tsp oil in a pressure cooker, add the spices (from bay leaf to shah jeera) and cook until fragrant, about 1 minute. Next add the onions and cook on medium flame until the edges start to brown. This has to be done low and slow to get the maximum flavor from the onions. Add ginger+garlic paste and cook for 1 minute. Stir in the chopped herbs and cook for another minute. Drain the water from the rice and reserve the water. Add the rice to the pressure cooker and gently stir to get all the grains coated with the spice mixture, cook for about a minute. Add the reserved water, salt and cook for 1 whistle. After 1 whistle, reduce the flame to low and cook for 1-2 minutes. Remove from flame and let the pressure release naturally. 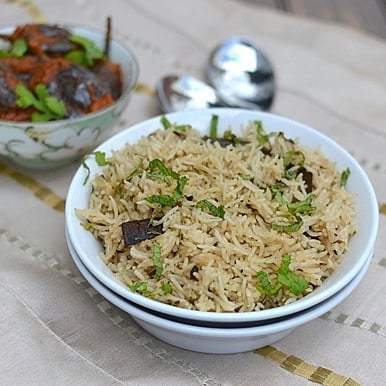 Fluff the rice ans serve with your favorite side dish.